December 1, 2014, Art Basel Miami: It starts quietly enough with a murmuration of starlings, a blob-like cluster of birds flying in perfect formation while re-morphing, changing shape, moving up and down the horizon, but retaining their amorphous sense of unity throughout the aerial dance. I am on 79th Street, stuck in traffic, trying to reach the first of many events, when just as suddenly the birds vanish into the gold-anodized filigree of the once dreaded INS Building on Biscayne Boulevard, formerly the Gulf American Building, but now abandoned. The moment of unexpected natural beauty will resonate throughout the week as a revelatory message of sorts. I only have to figure out what it means. The Art Basel week begins at 4PM with a tour of the newly refurbished and expanded Design District with developer Craig Robins and Mathieu Le Bozec of L Real Estate (an LVMH subsidiary). With all the $-millions flowing in from LVMH and its subsidiary L Real Estate, Robins has managed to skip several stages of gentrification and go directly from scrappy mixed-income neighborhood (in the shadow of the Interstate 195 overpass) to platinum luxury utopia, without many of the intermediary steps one normally expects in such urban transitions. More than a hundred luxury brands are either already open or will soon be open including Bulgari, Cartier, Louis Vuitton, Pucci, Versace, Dior, Givenchy, Dolce & Gabbana, Hermes, Tom Ford, etc. One looks for the grand architectural gesture and finds instead a high-end shopping mall, a protected urban space fortified with luxury brand logos and a variety of surface treatments. Much of the effect is just that, special effects, well-placed claddings, wrappings and graftings, a kind of architectonic nipping and tucking that employs reflective glass, mottled surfaces and theatrical lighting to achieve the desired suspension of disbelief. The question remains, will it be an effective enough illusion to lure zillionaire shoppers from the lush comforts of Bal Harbour Shops and the other high-end venues of South Florida? Without them, the heady rise of the Design District may turn into an equally precipitous decline. The new Palm Court creates a conspicuously fortified enclosure to protect Manolo Blahnik-wearing shoppers from accidentally bumping into urine-scented street folk, but the plaza is semi-public, open on the north and west to pedestrian traffic, and soon there will be an outdoor cafe on the second level and a handsome cast-concrete public events space designed by Aranda/Lasch to help lure non-shoppers deeper into the complex. Some of the unfinished buildings have been draped with translucent mesh veils that give them a mysterious, burka-like presence. There’s also an element of folding and pleating going on in some of the facades. The Aranda/Lasch building is clad in cast concrete slabs with patterned imprints that mimic a kind of embroidery. The two-story arcade of narrow glass fins by Japanese architect Sou Fujimoto reads as a lattice of chilly blue icicles. 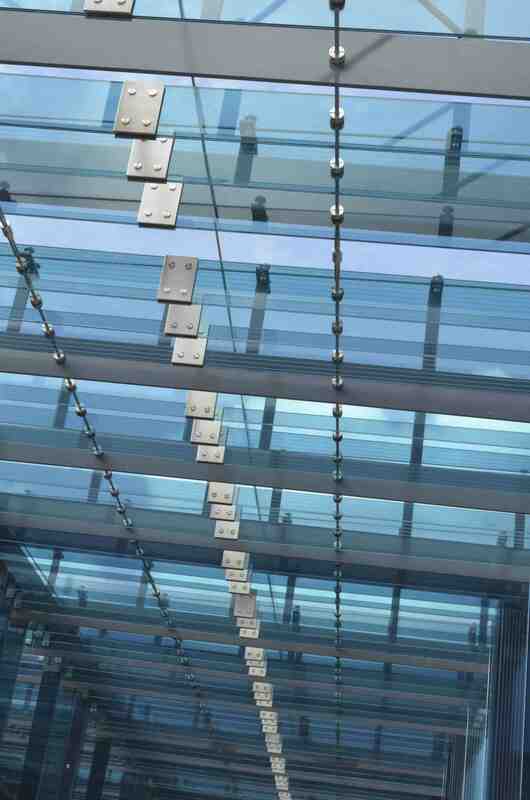 It may help to break the ferocity of the Miami sun while framing the shops along the southern side of the Palm Court, but its engineering seems fussy and needlessly overwrought. The District is desperately in need of more parking, as is all of Miami, and the origami-like folds of Leong Leong’s multi-level garage on North Miami Avenue (still unfinished and a block to the west of the Palm Court,) are best seen from the elevated perspective of Interstate-195 as blue-and-white metallic membranes appear to crinkle from side to side as one drives by at 70 MPH. People have been talking more about the gridlock traffic than art or design this week, so it’s no surprise that parking takes on an elevated status in this auto-centric city that has such a long history of inadequate public transportation. Leong Leong’s structure joins a roster of high-design parking structures by the likes of Herzog & De Meuron, Rem Koolhaas, Zaha Hadid and Enrique Norten. 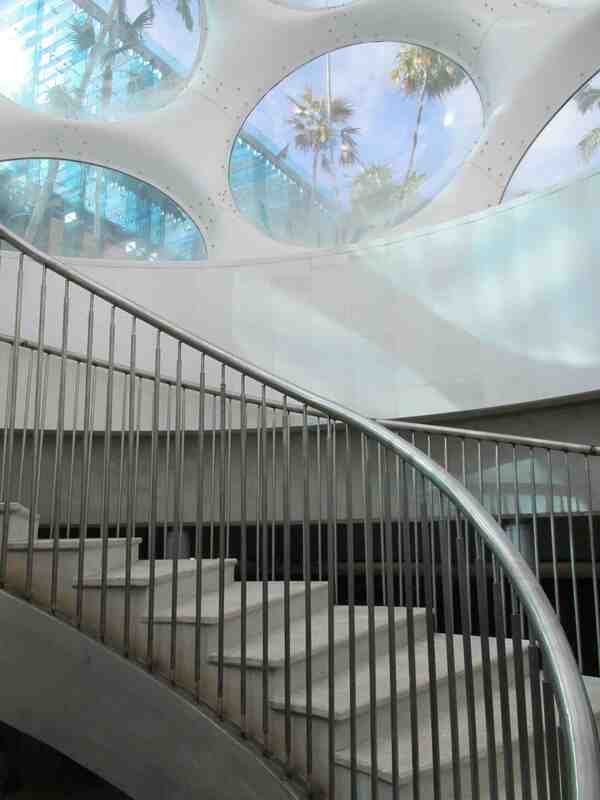 The Design District’s star attraction, however, is Bucky Fuller Fly’s Eye dome that dropped like an alien intruder into the very heart of the complex. It’s a digitally re-engineered version of the original 24-foot-diameter Fly’s Eye that was fabricated in 1979 by John Warren and is now installed on the western deck of the Perez Art Museum, two miles to the south. 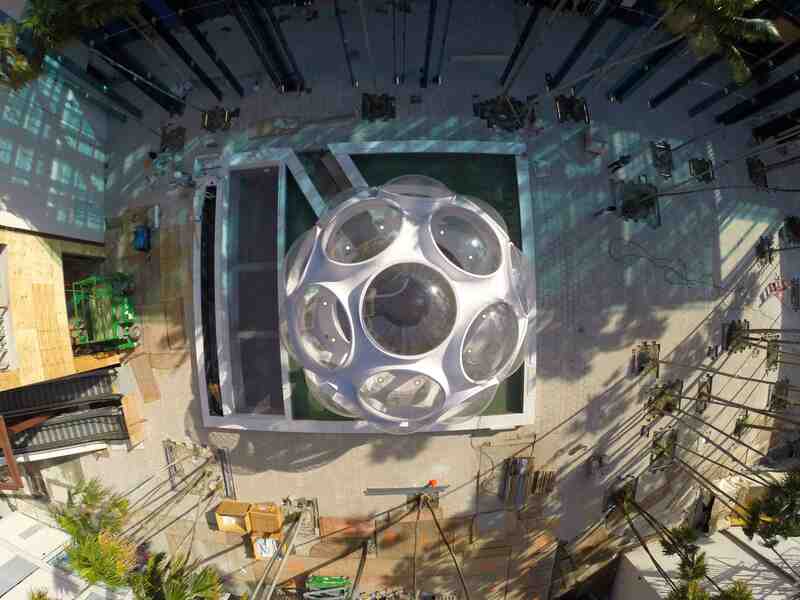 The new version was built by Dan Reiser to meet local codes, and has already become the symbolic centerpiece of the entire Design District, upstaging all of the architecture that surrounds it and, like Superman’s magic crystal, pulling together the disparate parts of the neighborhood through some alembic kind of magnification and transmutation that only Bucky Fuller would have understood. Arrive late at opening reception for the EDITION (née Seville Hotel), pushing past tall thin models in black lycra mesh who stand guard like “the Hounds of Hell”, (as one rumpled writer suggests), transparent clipboards as their shields. 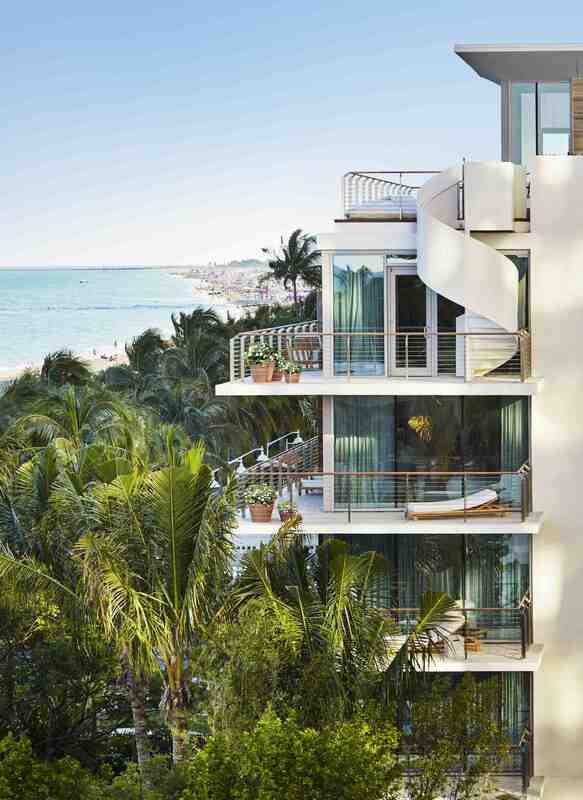 The refurbished hybrid (at 2901 Collins Avenue) was concocted by Ian Schrager in tandem with Arne Sorenen of the Marriot. John Pawson is project architect and interiors are by Yabu Pushelberg with black walnut veneers and sandy shades of beige with creamy pale undertones. We, the rather docile and anemic-looking design press, sit in the “Matador Room” beneath a 20-foot-diamter chandelier, a giant daisy cutter, from the 1950s and listen to Shrager and Sorenen compliment one another and explain how they had created the highest-end luxury boutique hotel on Miami Beach, comparing their efforts most humbly to the corporate branding of Apple. The original Seville (1955) was designed by Melvin Grossman, protégé of Morris Lapidus and the new owners want to keep its rat-pack elegance in tact of the original while smoothing and slimming it down to suit a sleeker, more pampered clientele. (Basic room rates start at about $1,000 a night.) The Edition/Seville holds its own against the Fontainebleau and Eden Roc just up Collins and only lacks the kind of money-shot moment that Lapidus was so good at choreographing, but Grossman outdid his mentor when it came to the outdoor circular bar and multi-level diving platform, both of which have been lovingly restored along with the oversized chandeliers and gold mosaic columns in the lobby. Drink far too much on first evening: brandy concoction then vodka with pomegranate at Gucci preview (“Smell the Magic”); gin and tonics at “Untitled” Vernissage on beach at 12th Street; several beers and single malts at “Intimate Dinner” for more than 350 at Morimoto Restaurant to honor ubiquitous artist Marina Abromovic who can’t stop hugging and kissing everyone and posing for endless selfies with photographer Todd Eberle; a few nightcaps at another gala, my head pounding all night and wake up feeling like an Art Fair whore. 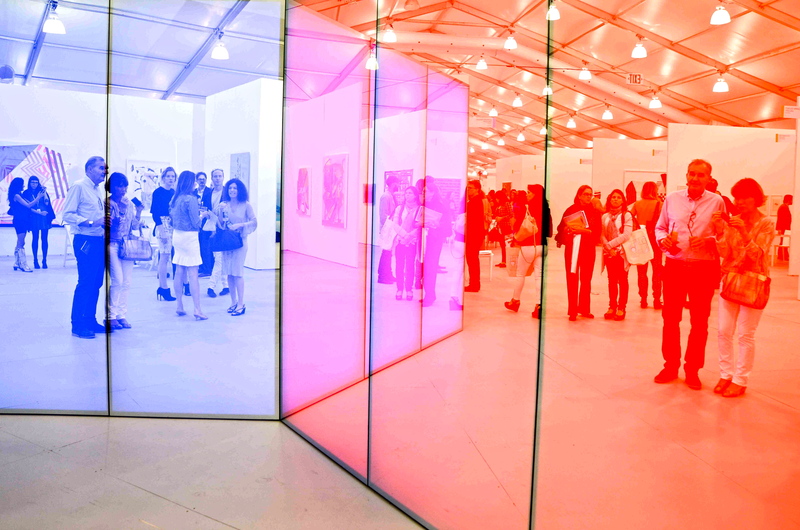 Design Miami opens for previews on Tuesday and at last acknowledges the environment in three curated shows within the main exhibition pavilion. 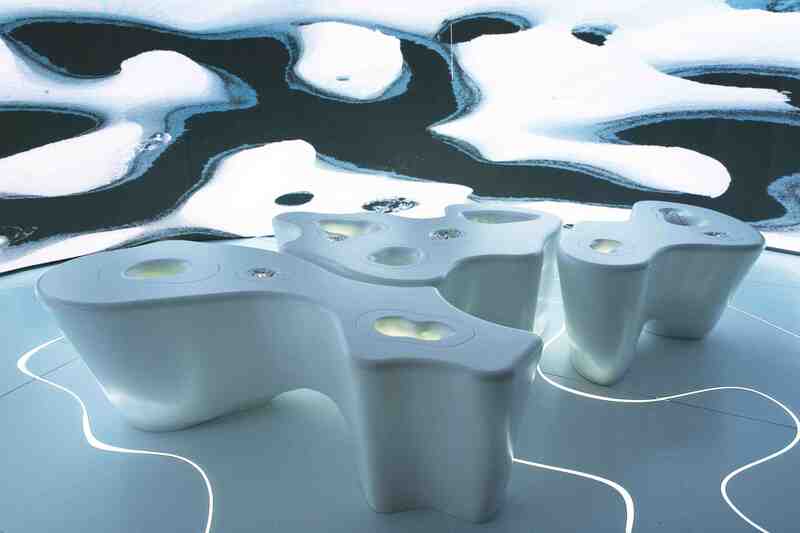 For Swarovski, Jeanne Gang, luminous Chicago architect, offers “Thinning Ice”, an ingenious interpretation of melting polar ice caps with white enameled icebergs rising from a reflective floor laced with rivers of melted ice (tiny Swarovski crystals) flowing through narrow fiber-optic streams. The tabletop masses are punctured by ravines and thaw holes that contain enchanting deposits of crystals which appear to glow with mysterious emanations while the walls support images of melting glaciers by James Balog. 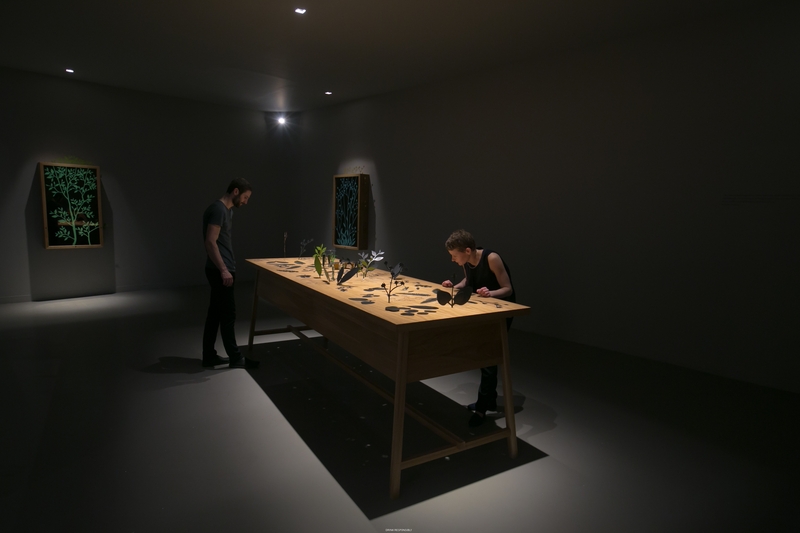 Perrier-Jouët’s “Ephemera” by Katharina Mischer and Thomas Traxler is a mechanical ornamental garden that rises and falls in response to human movements around a large oak table, a sweetly melancholic reminder of man’s love-hate codependency with Nature. Olson Kundig Architects deliver the finest gesture of the show with a lounge installation called “38 Beams”, bringing a muscular Northwestern vibe to Miami’s often ephemeral sub-tropical environment. It’s a kind of Lincoln Logs stacking of horizontal beams that allows for visual and atmospheric penetration from the main hall so that VIPs won’t feel so lonely and removed while sitting within, sipping glasses of Perrier-Jouët. The massive beams, measuring about 15″ by 30″ and 30 feet long, were recycled from an old industrial building in Los Angeles, refurbished, flame-proofed and then lightly sanded by Spearhead, a specialty wood fabricators in Vancouver. The lighting and music were also created by Northwestern talents and even the hostesses wear white overalls designed by Seattle designer Totokaelo. On Thursday morning I’m obliged to moderate a fractious panel on the theme of “The Future of Design” at an industrial complex in the Little River area of North Miami with furniture diva Patrizia Moroso, Italian architect/designer Piero Lissoni, and Israeli-Brit enfant terrible Ron Arad who speaks about his remodel of the infamous Watergate building in Washington DC. As well as architectural changes, Arad has designed everything from furniture to napkins and stationary with a font based on shredded documents from the Watergate hearings of 1973. He also managed to sabotage the planned program by unveiling a new prototype inspired by a funky old mattress that he spotted on the street near his London studio. The mattress was bent against a wall, deformed, reeking of malodorous human indignities, but Arad became obsessed with its form, taking photographs, making sketches and somehow transforming the mattress from trash into an elegant low-impact couch that he named “Matrizia” in honor of Patrizia Moroso who laughed and, on the spot, agreed to put the thing into production at her family’s 62-year-old factory in Udine, Italy. A design critic from England pointed out that while most designers see a problem and attempt to come up with a solution, Arad sees a problem and creates more problems. Winds off the ocean are strong and the traffic gets even worse. After a long sleepy lunch on a balcony overlooking a railway line, I go swimming in the turbulent ocean and it feels good to get away from all the art and design events even though I get stung by a cluster of small blue jellyfish. 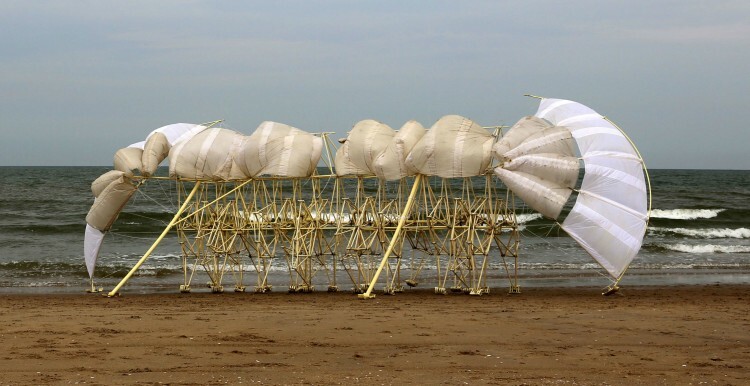 A rash spreads up my neck in the shape of a radiating vector and the stinging only begins to subside as I arrive at an Indonesian dinner in honor of Theo Jansen, Dutch artist and star of the week who created the Strandbeests (“beach animals”), articulated, kinetic sculptures that walk along the strand like giant, multi-legged insects, powered only by wind power. Friday morning, the wind whips off Biscayne Bay, rattling through the portals of the Perez Art Museum and the concrete cavities of Nick Grimshaw’s Museum of Science, seeming to pick up velocity as it caroms off buildings and spills down onto the site of this morning’s official groundbreaking for One Thousand Museum, the bone-like, 62-story tower designed by Zaha Hadid. A temporary wall of trees tips over and spreads dirt over the carpeting. Tables collapse, champagne glasses shatter. Waiters with mimosas and tiny croissants try to contain the damage. Valet parking attendants and security personnel scatter and then regroup as Hadid herself arrives, an hour late, entering the throng like a rock star, a royal personage, a diva who now finds herself surrounded by crazed fans pushing their I-Phones into her face and inching closer to get a shot of the architect who is now trying to smile, now looking somewhat embarrassed, now growing concerned for her own safety as a Miami-Dade cop pushes into the mob and goes to her rescue, shielding her from further abuse. I’m supposed to get a 15-minute interview but abandon all hope and leave the scene before Hadid scatters the first ceremonial clump of dirt. There’s a Champagne Brunch on the beach, an immersive video event, a plastic pollution installation in Wynwood, the Peter Marino show at the Bass Museum, a Prouvé demountable house at the Delano that I still haven’t seen but I give up after sitting for an hour in cross-bay traffic and finally abandon my car by the side of the road and cross the Venetian Causeway on foot. It seems that protests have broken out in reaction to the Eric Garner grand jury on Staten Island. Roads are blocked and conditions escalate when news gets out about a similar case of police brutality in Miami itself: Delbert Rodriguez Gutierrez, a 21-year-old street artist otherwise known as “Demz,” was run over by a squad car this morning when the cops spotted him “tagging” a private building near 24th Street and gave chase. Gutierrez is now in hospital in critical condition suffering from severe brain trauma. All week the entire Wynwood area has been filled with graffiti artists from around the world, but no one thought to arrest them because they were being “artists” working in tandem with Art Basel Week. The crowds are swelling, tempers flaring, momentum building as the mob moves outward and expands into a single body with a single mind: “I CAN’T BREATHE!” they chant, holding up their hands, “I CAN’T BREATHE!” echoing Garner’s dying words. Gaining confidence, the protesters march onto Interstate-195, shutting down the Julia Tuttle Causeway, a prime connector between mainland and beach, between art fairs and design shows, disrupting the to and fro, the art world gossip, the back-room deals and interviews and celebrity cluster fucks, VIP red carpets, vacuous panel discussions. Suddenly the entire Art Basel Bubble bursts with the loud refrain: “I CAN’T BREATHE!” and there is nothing left but an urge to file this report as quickly as I can, but feel pressed to relate the ending back to the beginning–as a proper story should–when the starlings rose up in their murmuration on Monday afternoon and appeared to be telling me something that I couldn’t understand, and am still at a loss for words. Postscript: Graffiti artist Delbert Rodriguez Gutierrez died Tuesday night, December 9, 2014.